This was originally posed in January 2009. I'm reposting this with new photos. I'm not sure why it took me so long to make my own granola to sprinkle on yogurt for breakfast, considering how incredibly easy it is! The recipe below is a mixture of various ideas, and it's pretty simple. I'm especially fond of the addition of malt extract* that I got from Moosewood granola recipe included in the Moosewood Restaurant New Classics - it adds a lovely, well, malted flavour to the end product. 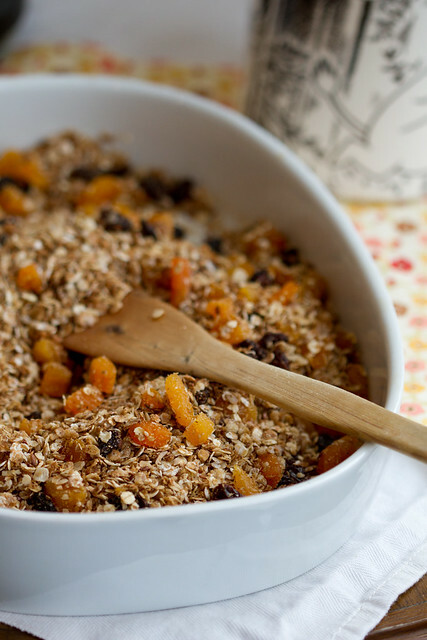 I've used a mixture of chopped apricots, seedless raisins and dried cranberries to 'buff up' my granola, but the choice of dried fruit is obviously yours. Mix the oats, sugar, coconut flakes, linseed and cinnamon in a bowl. Stir in molasses extract, oil and water, stir to combine. Line a small baking tray with a parchment paper and spread the granola mixture on top. 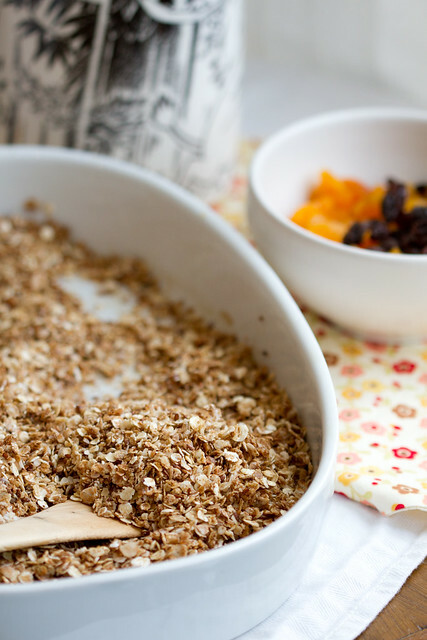 Bake in a pre-heated 200 C/400 F oven for 15 minutes, stirring once or twice while baking, until the granola is golden and very aromatic (it will crispen up after you take it out of the oven). Take out of the oven and cool completely, then stir in the chopped dried fruit. 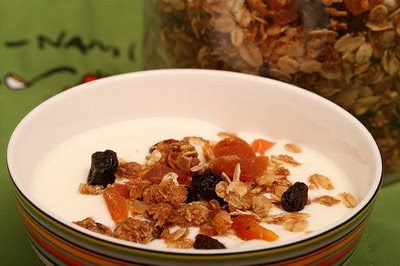 Keep in a closed jar and serve with your breakfast yogurt or milk. * Moosewood recipe uses "barley malt syrup or unsulphured molasses", explaining that "Barley malt is a liquid made from fermented barley and often used in baking bread. We use it here for sweetness and moisture. If unavailable, any unsulphured molasses except blackstrap will work fine". I used a local product which is meant for brewing your own beer at home, but is also widely used for baking bread at home. I like to make my own, and I don't eat it to be healthy. 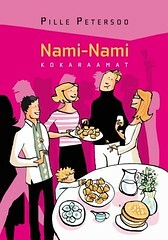 Mine had brown sugar, maple,raisins, cocunut, nuts and warm spices. typically you don't get the large juicy chunks that is in store bought. Save with Clickmycoupon's Printable Coupon Services. From store ones I like Dorset most. But homemade depends usually what we have. Different dried fruits, nuts etc. oh YUM! This is getting a spot near the top of my to-do-list. Sounds delicious. It's so easy, isn't it? I've been experimenting too, looking for something that makes all the difference. Perhaps your malt idea??? ma tegin ka hiljuti ise ja oli ikka mõnus küll. Nüüd just plaanin uuesti teha, tahaks seekord kakaoga teha ja mõned mõtted on veel tekkinud. 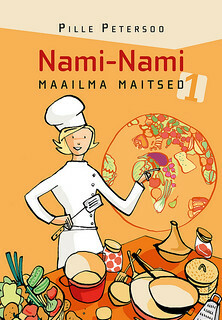 Aga sinu oma näeb nii ilus välja ja linnaseekstrakt tundub täielik 'stroke of genius'. We've been making Adele Davis granola -- 5 parts oats to 7 parts goodies and then 1 part each of oil and honey. I'll have to try this one next, though. Like you, I haven't made my own but I am definitely going to do so shortly. It sounds childishly simple! Just waiting for our house purchase to be finalised so that I can get access to a proper, big oven that will take my big Silpat!! Sounds yummy. 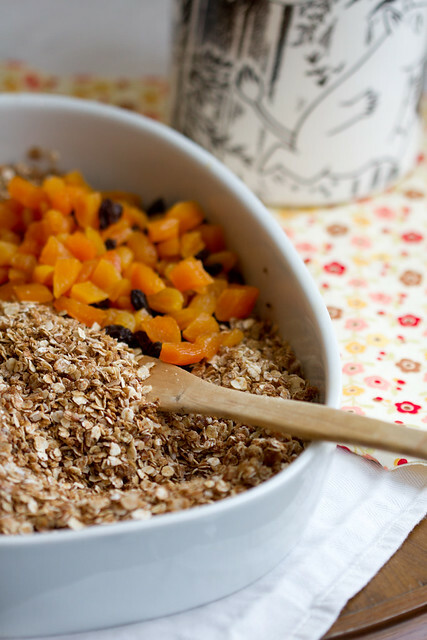 I just posted my own granola recipe on my new blog, The Tangled Nest. Fruit juice adds part of the sweetness and moisture, so it's has less fat than some granolas. My daughter loves it! This looks really good. Thanks so much for sharing.